Had you $1800 to spend on footwear in 2012, you might have considered buying a pair of RayFish sneakers. Delivery would have taken a while because you were invited to design the patterned leather yourself. You would have then have had to wait while the company grew a pair of transgenic stingrays in their Thai aquaculture facility up to the age where their biocustomised skins could be harvested. Alas, animal rights activists released the company’s first batch of rays into the wild before harvesting could take place, and the company suspended trading. Scuba divers still regularly report sightings of fish sporting the unlikely colourations that were RayFish’s signature. RayFish was, you’ll be pleased to hear, a con, perpetrated by three Dutch artists five years ago. It now features in Fake, the latest show at the Science Gallery, Dublin, an institution that sells itself as the place “where art and science collide”. The word “collide” is well chosen. “We’re not experts on any one topic here,” explains Ian Brunswick, the gallery’s head of programming, “and we’re not here to heal any kind of ‘rift’ between science and art. When we develop a show, we start from a much simpler place, with an open call to artists, designers and scientists.” They ask all the parties what they think of the new idea, and what can they show them. Scientists in particular, says Brunswick, often underestimate which elements of their work will captivate. Founded under the auspices of Dublin’s Trinity College, the Science Gallery is becoming a global brand thanks to the support of founding partner Google.org. London gets a gallery later this year; Bangalore in 2019. The aim is to not to educate, but to inspire visitors to educate themselves. Brunswick recalls how climate change, in particular, triggered this sea-change in the way public educators think about their role: “I think many science shows have been operating a deficit model: they fill you up like an empty vessel, giving you enough facts so you agree with the scientists’ approach. And it doesn’t work.” A better approach, Brunswick argues, is to give the audience an immediate, visceral experience of the subject of the show. For example, in 2014 Dublin’s Science Gallery called its climate change show “Strange Weather”, precisely to explore the fact that weather and climate change are different things, and that weather is the only phenomenon we experience directly on a daily basis. It got people to ask how they knew what they knew about the climate – and what knowledge they might be missing. Playfulness characterises the current show. Fakery, it seems, is bad, necessary, inevitable, natural, dangerous, creative, and delightful, all at once. There are fictional animals here preserved in jars besides real specimens: are they fake, or merely out of context? 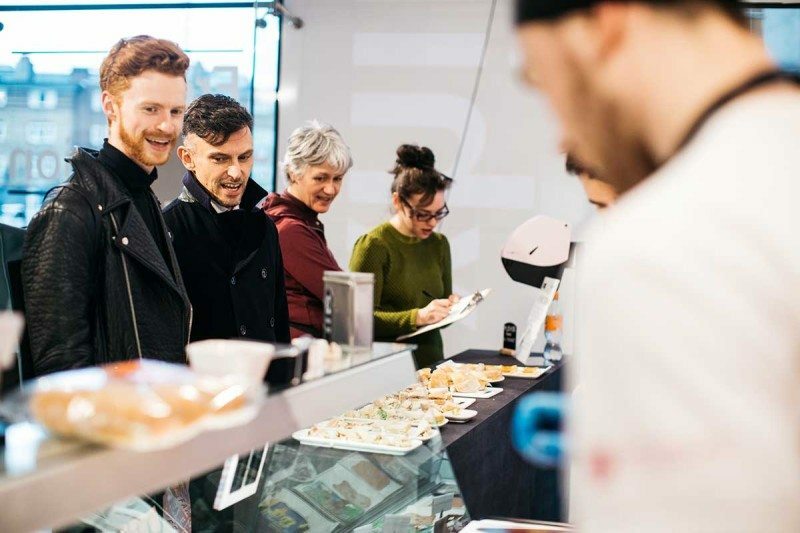 And you can (and should) visit the faux-food deli and try a caramelised whey product here from Norway that everyone calls cheese because what the devil else would you call it? Then there’s a genuine painting that became a fake when its unscrupulous owner manipulated the artist’s signature. And the Chinese fake phones that are parodies you couldn’t possibly mistake for the real thing: from Pikachu to cigarette packets. There’s a machine here will let you manipulate your fake laugh until it sounds genuine. Fake’s contributing artists have left me with the distinct suspicion that the world I thought I knew is not the world. Directly above RayFish’s brightly patterned sneakers, on the upper floor of the gallery, I saw Barack Obama delivering fictional speeches. A work in progress by researchers from the University of Washington, Synthesizing Obama is a visual form of lip-synching in which audio files of Obama speaking are converted into realistic mouth shapes. These are then blended with video images of Obama’s head as he delivers another speech entirely. It’s a topical piece, given today’s accusatory politics, and a chilling one.